A few weeks ago I got a personal email invitation to attend the I Love Forest Park 5K Run/Walk by a race coordinator that follows my blog. 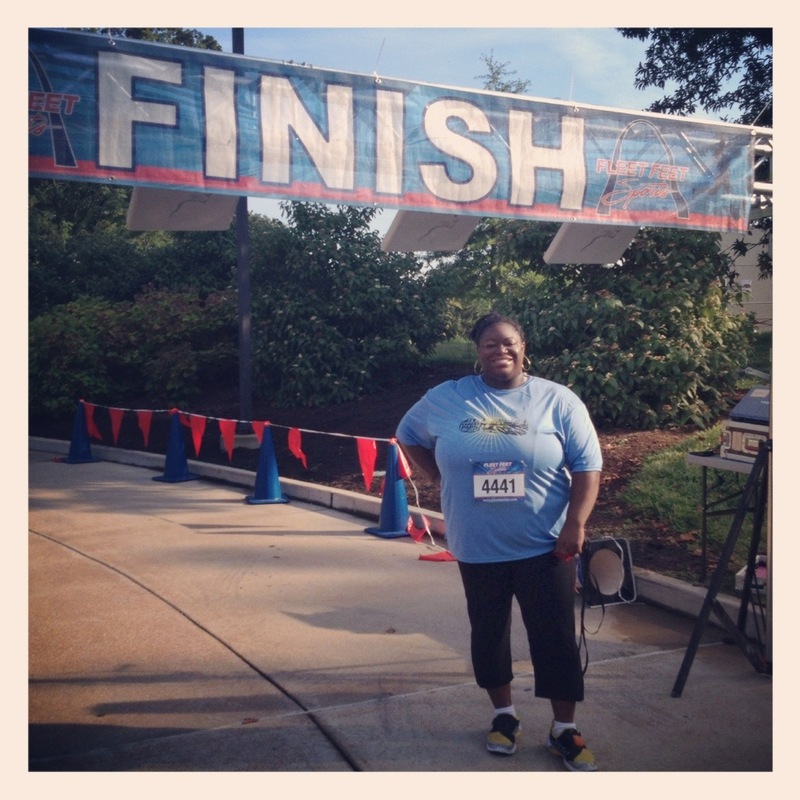 I’ve been working with my personal trainer, but I definitely have not been training to run a 5K. However, I was honored by the invitation so I accepted it. I decided to walk and my lawyer friend was supposed to walk with me. She had work obligations that came up and she was no longer able to join me. On the morning of the race my Gym Cousin was not feeling well and he was not able to join me either! I had not really recruited any other friends or family members as participants or cheerleaders. So, on race day morning, it was Me, Myself and I.
I realized that the coordinator that signed me up via email never asked for my real last name. I went to the registration desk and asked “Ummm do you have a registration for Ummm Carli “Fierce”? The lady said, “Well that would be really cool if we did!” I explained that was my blog name and that the other lady never asked for my real last name. They couldn’t find my race registration under “Fierce” or my less interesting real last name “Miller” either. So, I just filled out the paperwork and they gave me a really cool mesh T-shirt and race number. Much to my shock and horror I found out that there were only about 300 participants, there would be no blending in the crowd. Many of the runners were track students from the local university. I also saw some fluffy girls and heavyset guys, but that totally did not mean that they were going to move slow. I overheard one big guy say he finally got his mile under 10 minutes. Oh crap, I said to myself, I’m going to be last. The only training I’ve done is the 5K walk I did on my lunch break two days ago. At 7:30 AM, the runners took off and us walkers were behind them. I saw one lady I thought I might be able to keep up with, but she started to run after about 5 minutes. I had to laugh, because I thought, she’s probably listening to my Couch to 5K Podcast. After about 10 or 15 minutes I was behind all of the walkers. Uh oh. One of my greatest fears was about to become true. I might actually finish last in a 5K race. I saw this old lady not too far ahead of me and I had an outrageous vision of me tackling her football style as she attempted to cross the finish line in front of me. Anything not to be last. But even she got too far ahead of me. I was starting to panic. I was listening to my Race Day Podcast which gave me a few encouraging words. I did a few little jogging spurts but, I knew if I pushed too hard that I would be too tired to finish. I felt like smacking myself in the forehead, “Silly girl, why didn’t you train?” All of the push ups, planks, weights and squats do not equal running 3.1 miles. So, my new goal was just to finish. There was a little car with a police light that followed me just about the whole race since I was the last person. I started to think about the people that I’ve seen at the end of a race and what I thought about them. I never thought of them as pathetic, I really thought of them as courageous for not quitting. The guy at the halfway point water stand made a little joke and said I was doing great, because he thought it was my second time around. One of other the volunteers said that he’d lost 40 pounds this year and that if I kept pushing I could do it too. That was encouraging. When I was about a half a mile from the finish line I saw a lady walking towards me. Then, she came and walked with me. She said she was so inspired by watching me push through by myself back at the water stand. She didn’t want me to feel alone. She asked what was my motivation. I told her about my blog and that I was making an effort to get healthy. She said that I was doing great and that the first year when she did this race with her daughter, they had shut down the whole thing by the time they had finished. She walked with me all the way to the 3 mile point. I didn’t see her again after that, but I was so grateful for my cheerleader. I finished that pesky little .1 mile and ran across the finish line by myself. One of my greatest fears came to life. I’m about 99.9% sure I was in dead last place. But guess what? The world continued to spin on its axis, I did my best, I inspired someone along the way, and for that I am proud!